Bacopa monnieri (Brahmi) a nootropic herb said to assist the mind and enhance awareness. Considered a “brain tonic” for its memory and cognitive improving benefits. 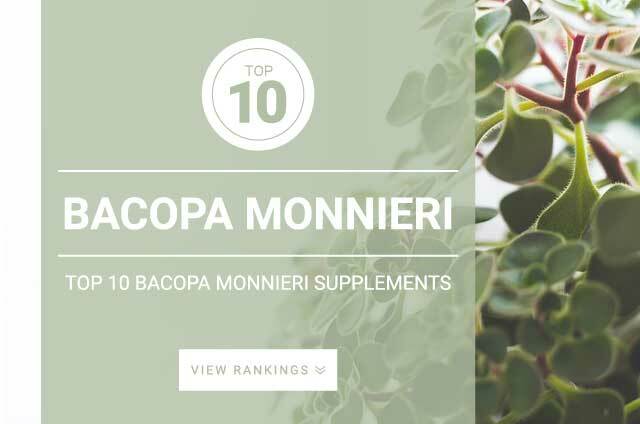 Onlinestrength analyzed 10 best-selling Bacopa monnieri supplements in the United States. We looked for effective dosages of Bacopa monnieri extract, key active compounds bacosides, and levels of preservatives, fillers, and binders. Bacopa monnieri is a powerful nooertropic that may cause stomach issues when taken without food. For this reason, products that contained preservatives that may cause digestion related issues were ranked lower. Products that used high quality, organic, non-gmo sources of Bacopa monnieri were ranked higher. Bacopa monnieri extract in capsule form using plant-based capsule material were ranked higher for being easier to digest. Bacopa monnieri a nootropic herb used in Ayurvedic medicine for thousands of years for its ability to aid memory formation, enhance mental function, improve focus, boost motivation, and reduce anxiety. Found naturally in flowers that grows throughout much of Southern Asia. This “brain tonic” is known to help users keep calm under social pressure. This Adaptogen helps aid cognitive performance while under stress. Bacopa is an Adaptogenic herb which may help reduce stress and stress related health aliments. Adaptogenic herbs like bacopa may help reduce and alleviate anxiety. Standard daily dose of Bacopa monnieri extract: 300 – 450 mg standardized to contain 20% bacosides daily. If you’re using dried herb powder dosage range from 5, 000 mg – 10,000 mg daily.